Keen for a little laid back, cost effective merriment, a quartet of us made our first visit to Amused Moose, a comedy night in Soho which offers a weekly chortlefest comprising 4 comedians and the effervescent Mark Dolan as host. It takes place in Moonlighting Nightclub, which is easily found on one of the main roads in the heart of London's entertainment district and after relinquishing twelve pounds each, we dropped our coats at the free cloakroom and headed straight for the bar to whet our whistles before the first act. 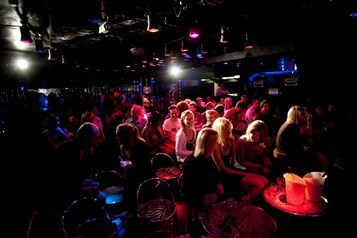 The club makes good and profitable use of its space before the crowds descend later, by rearranging the furniture around a small stage where the performers do their thing. There's something quite homely about being given a wooden stool to perch on, setting the scene for a more intimate gig. Organisers don't let the place get too crowded for the comedy and all with a ticket are welcome, whether in jeans or dinner jacket. Drink prices are very reasonable before 10pm and there's not too much loitering for service. A waiter is also on hand to receive and deliver food orders, although there's no obligation to eat. An announcer sounded Mr Dolan's arrival and proceedings began, with a high-energy introduction and several minutes of picking on those in the crowd who've already decided they're going to have a good time (birthday parties, stags, hens etc). By the time his skit is over, you're certainly ready for the main event. The beauty of having a variety of performers that differ each week is there's a high chance at least one of them will make you belly-laugh, even if the others aren't quite to your taste. Famous faces are mixed with fledglings. Two acts on this bill were excellent, regularly prompting spontaneous mass applause from the crowd despite their contrasting styles. Each performs for a maximum of half and hour, so you never have too long to wait if you do find one doesn't float your boat. The comedy finishes around 10.30pm but there is no pressure to leave. Entry to the nightclub is included in the ticket price and provided you have a stamp on your hand, you're welcome to stay until the small hours. Should you chose to leave after the comedy, retrieving your coat may take a little time - standard procedure when there's an exodus after any event. 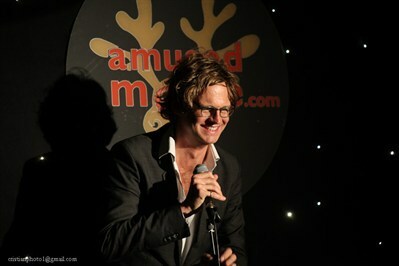 Amused Moose Comedy is one of those rare nights in that it manages to please everyone who goes. You can get involved or just be entertained. It is good value and a good laugh. The quartet left suitably satisfied and smiling.